In case of a rushed weekday dinner or a forgotten-about family event, it’s always smart to know an easy side dish that you can whip up without thought. My go-tos are usually a salad with a dijon dressing or a big batch of roast cauliflower since these accommodate most dietary restrictions, are tasty as heck, and they don’t take long to make. Recently though, I’ve gotten into another quick and easy favourite: smashed potatoes. No, not roasted potatoes. Those are an entirely different almost fries-y dish. And definitely not mashed. Those are just, well, mashed. I’m here to tell you about smashed potatoes: a crispy on the outside, soft on the inside, roasted side. They’re easy, require under 10 ingredients, few dishes, and use most ingredients that you probably have on hand. Perfect for last-minute cooking. Plus they’re freakin’ delicious. 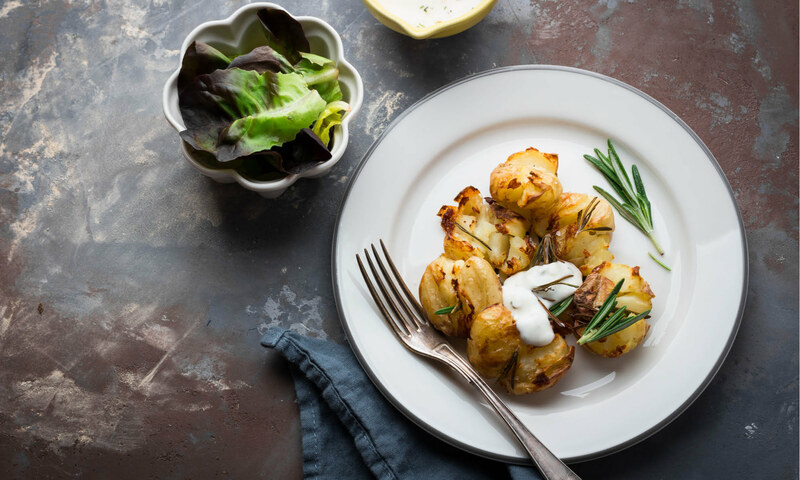 With these taters, you can mindlessly whip up a favoured side, win over your guests’ hearts, and – more importantly – beat out Aunt Jo’s mashed potatoes as ‘the favourite plate’ at Sunday dinner. They’re that good. Since they’re boiled first, these taters are crispy on the outside and slightly soft on the inside. Extra S&P enhances the flavour of the garlic, and rosemary adds a fresh touch. Also, be sure to use smaller potatoes. They’re easier to smash and are overall tastier. Cover a baking sheet with parchment paper (or lightly grease with oil). Bring a large pot of water to a boil. Once boiling, add potatoes and cook for about 15-20 minutes or until tender. Test with a fork. Place boiled potatoes on the baking sheet. With a fork, carefully press each potato until flattened (but still in one piece!). Drizzle with olive oil, minced garlic, alllll the salt and pepper, and rosemary. Make sure each tater is evenly covered. Place in oven and bake for 18-20 minutes until golden brown and crispy. Remember: the crispier the better. Serve on a platter and drizzle with sauce if using. Enjoy! Then sit back, relax, and wait for your guests to reach for seconds. It’s *almost* 100% guaranteed.